It seems like every summer, someone I know is getting married or celebrating a big anniversary and this year is no exception. My good friends Judy and Phil Richardson had a small gathering to celebrate the recent marriage of their daughter, Mary to David. And Mary orchestrated a 50th anniversary surprise for her parents at the same time! 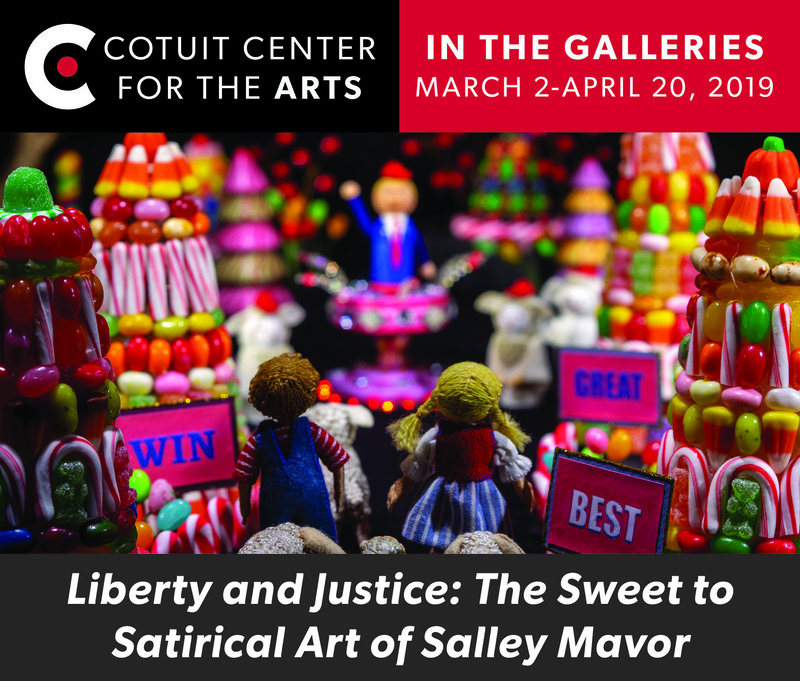 This was an opportunity for Terry McKee and me to partner up again for a cake and doll project. If you’ve followed this blog for a while, you might remember some other creative adventures that Terry and I have embarked on in the past. 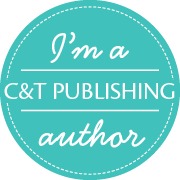 We’ve teamed up for so many cooking and sewing projects that we have a special category here. 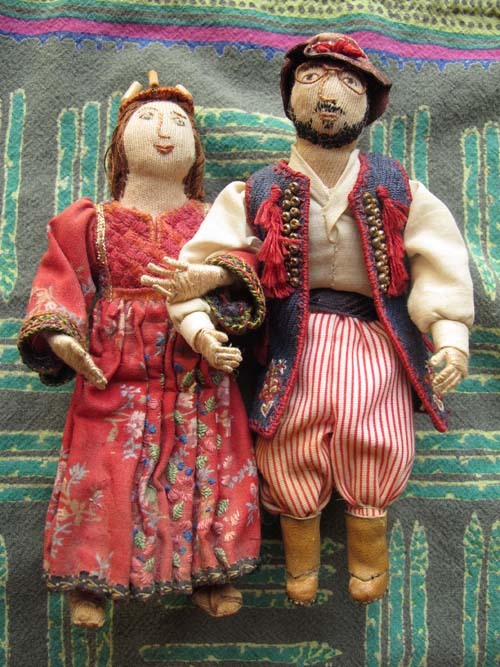 My part was constructing 2 sets of wedding dolls, one of Mary and David and the other of Phil and Judy. It helped to have reference photos to make likenesses in face and clothing. 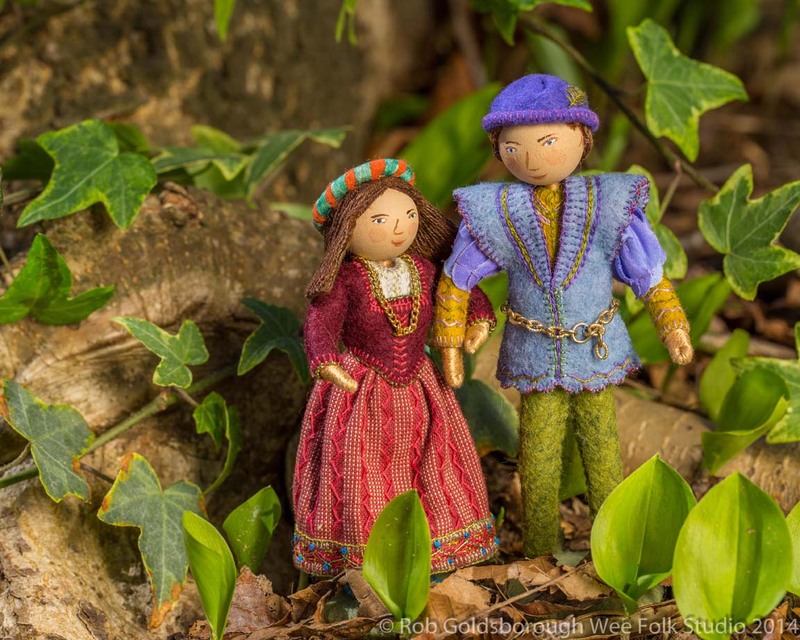 They were based on the patterns and directions in my how-to book, Felt Wee Folk-New Adventures. Terry made a delicious lemon bundt cake with a stand for the dolls in the center hole. 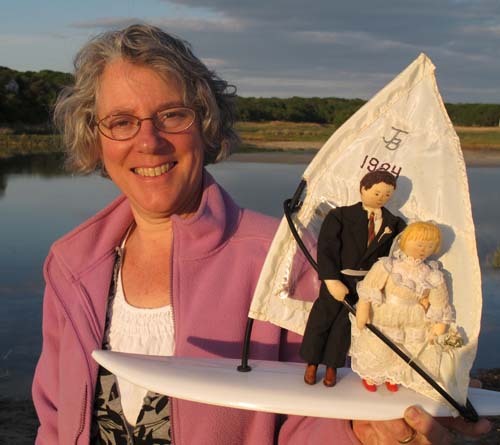 She devised a paper New York Skyline to surround the couple, complete with the Brooklyn Bridge and the Statue of Liberty. 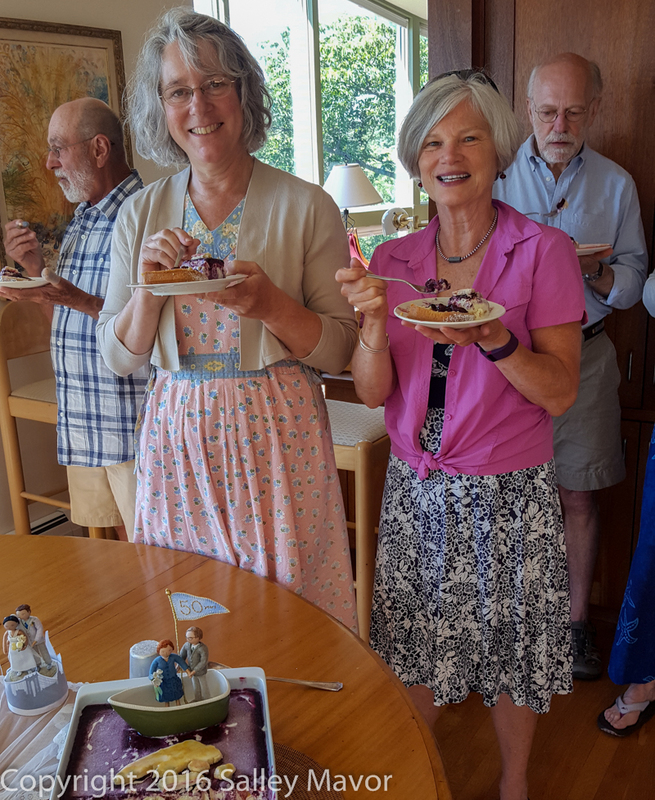 Judy and Phil, on the other hand, needed a vessel to ride in, since they would be floating in a sea of ice cream, glazed with blueberry compote. 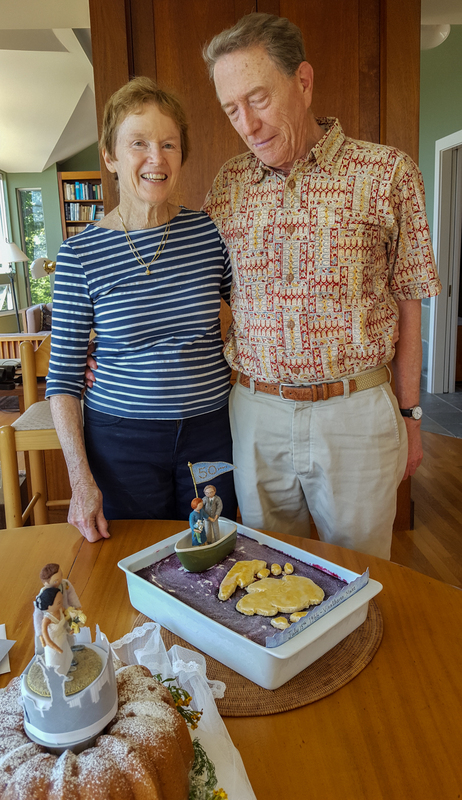 Terry came up with the idea of adding a shortbread depiction of Vinalhaven, Maine, where they were married 50 years ago. Here are Terry and I, enjoying the results. It was another successful collaboration indeed! My friend Terry’s son Max got married a few weeks ago. Over the years, Terry and I have worked together on so many fun projects, including these: wedding cake, baby quilt and community quilt. So, Terry and I conspired to make a special surprise for the wedding couple. 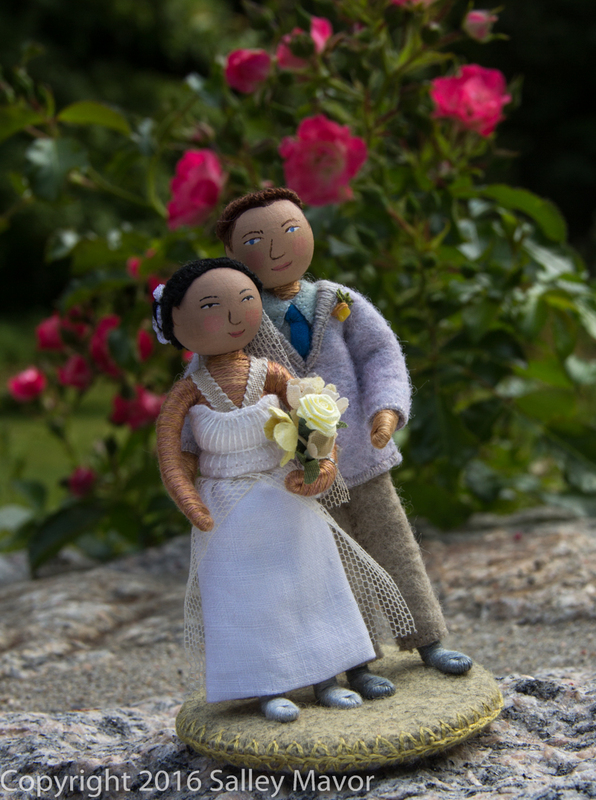 I couldn’t wait to make little Max and Beth dolls for the wedding cake. 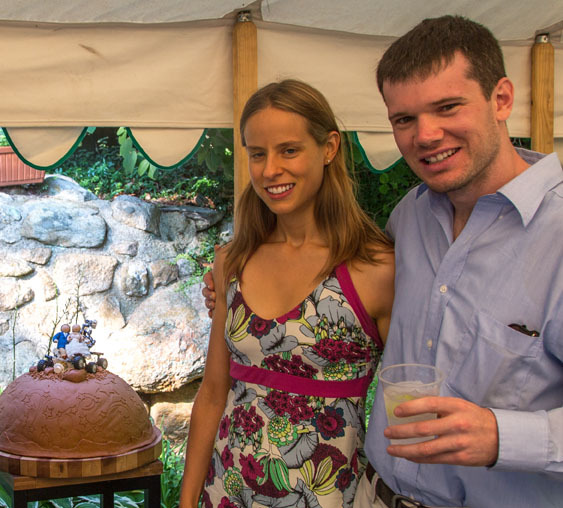 Max and Beth met when they both worked as engineers at the Jet Propulsion Lab in California. Since they helped design parts for NASA’s Mars Rover, it became their obvious prop. Terry found a set of Lego directions for making “Curiosity” and enlisted the help of Max’s cousin to put it together. Beth’s dress was one of those strapless jobs. Way before the wedding, Terry sent me a photo of the gown, so I could replicate it in miniature. 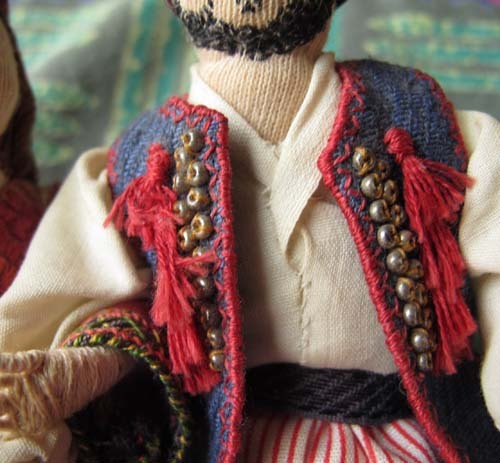 The biggest challenge was to make a smooth transition between the doll’s felt torso and floss wrapped arms. Usually sleeves or shoulder straps provide a break that hide any raw ends. You can see a couple of stitches on the top, where I fastened the top in place. I don’t know how real life women can wear this style, without the help of magic! In this close-up, her felt chest looks a bit fuzzy, hairy even. But that’s wool felt for you! 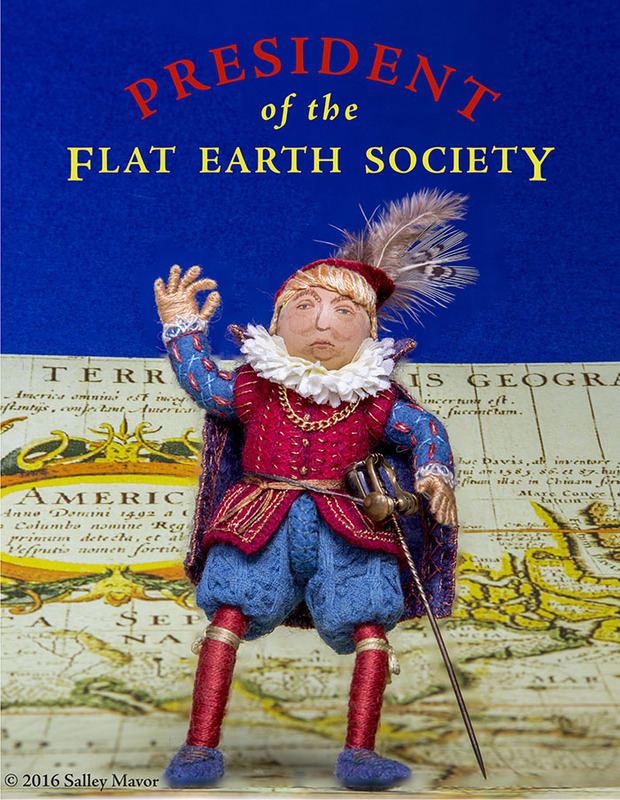 Fortunately, it’s not so noticeable on the 4″ doll size. 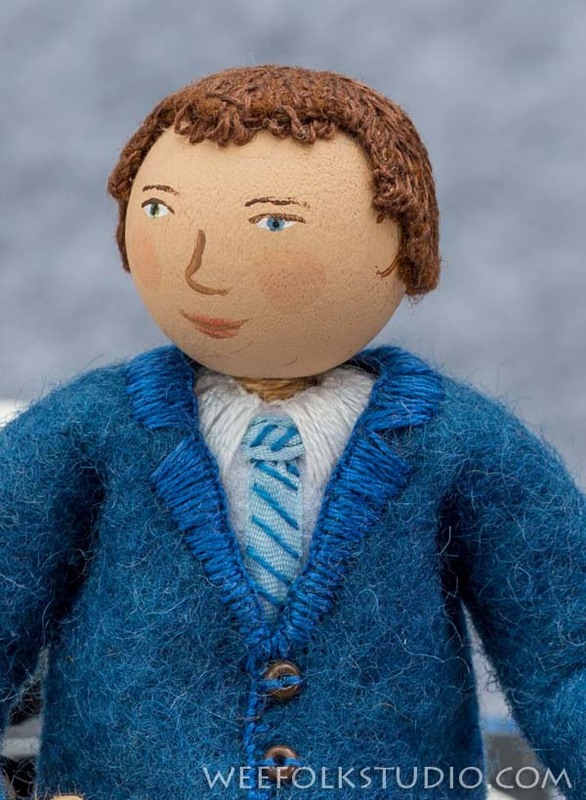 I’m glad that Max insisted on wearing a blue blazer and khakis, which gave the wedding a relaxed Cape Cod feel. They both looked spiffy! 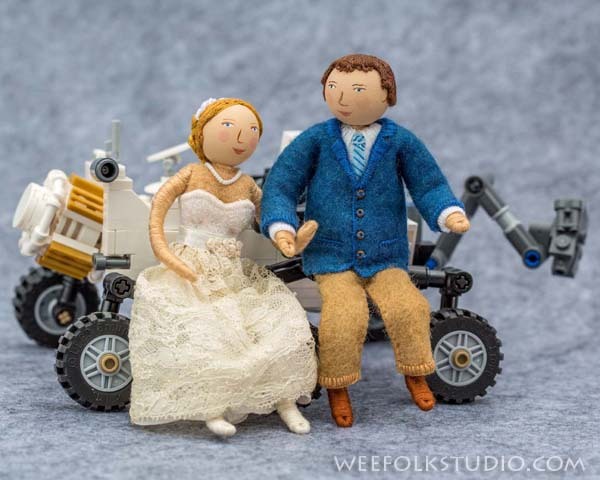 Before we go any further, I want to mention that my upcoming how-to book, Felt Wee Folk: New Adventures ( March 2015) will have many examples of wedding cake toppers for you to make. 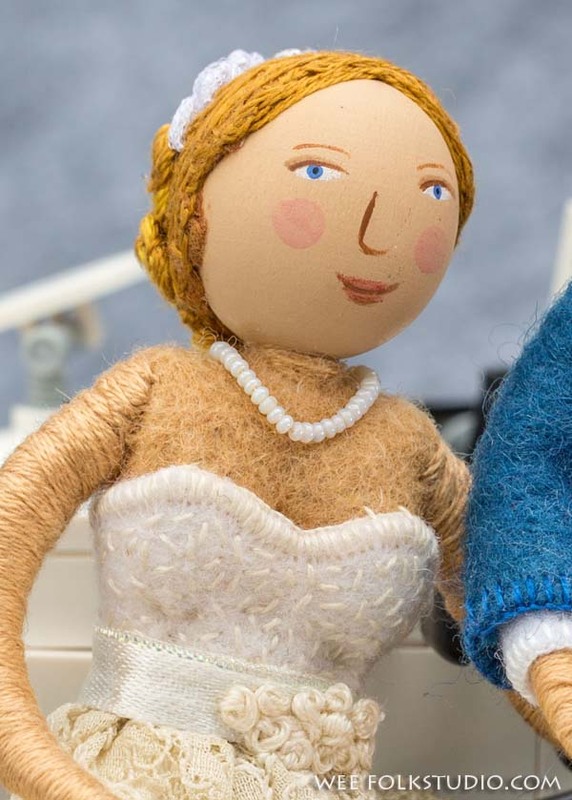 You can see other wedding dolls I’ve made here. 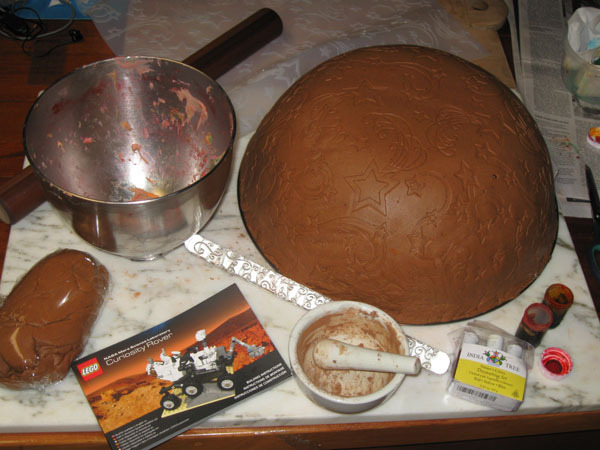 Terry was originally going to make a Mars cake for the rehearsal dinner, but decided to simplify things by constructing a non-edible “Mars” stand from an inverted bowl covered with fondant. It was tricky to get the color right and she ended up using beet powder, cinnamon and cocoa. 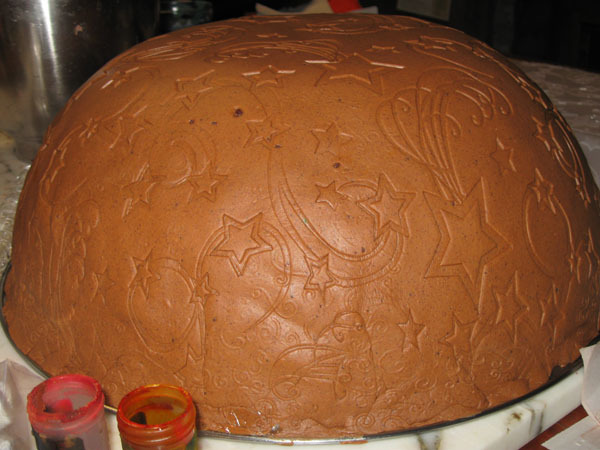 Terry rolled out the colored fondant and made impressions with a celestial patterned sheet of plastic and a rolling-pin, both with raised texture. She then spread the dough over the inverted stainless steel bowl. 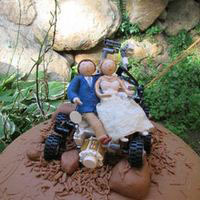 At the dinner, Max and Beth were totally surprised to see their likenesses lounging on the rover. The pair of dolls also made an appearance atop the wedding cake the next day. Both the rehearsal dinner and wedding were lovely events. 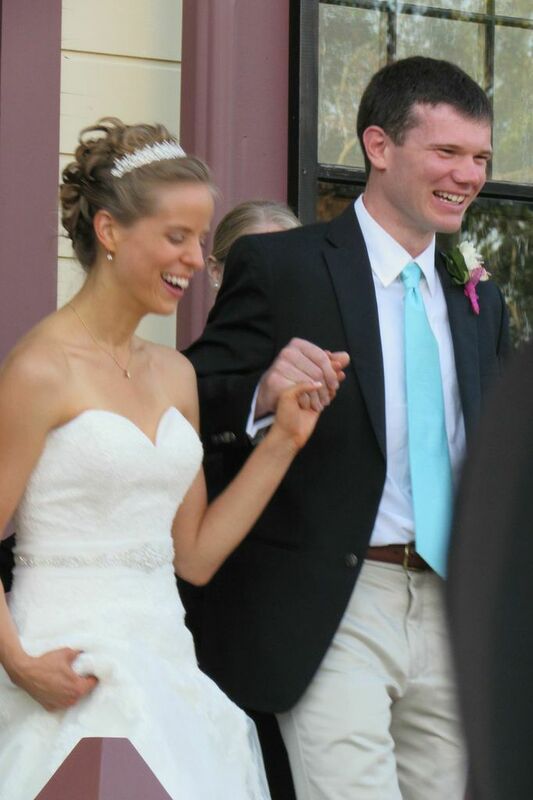 Congratulations, Max and Beth! 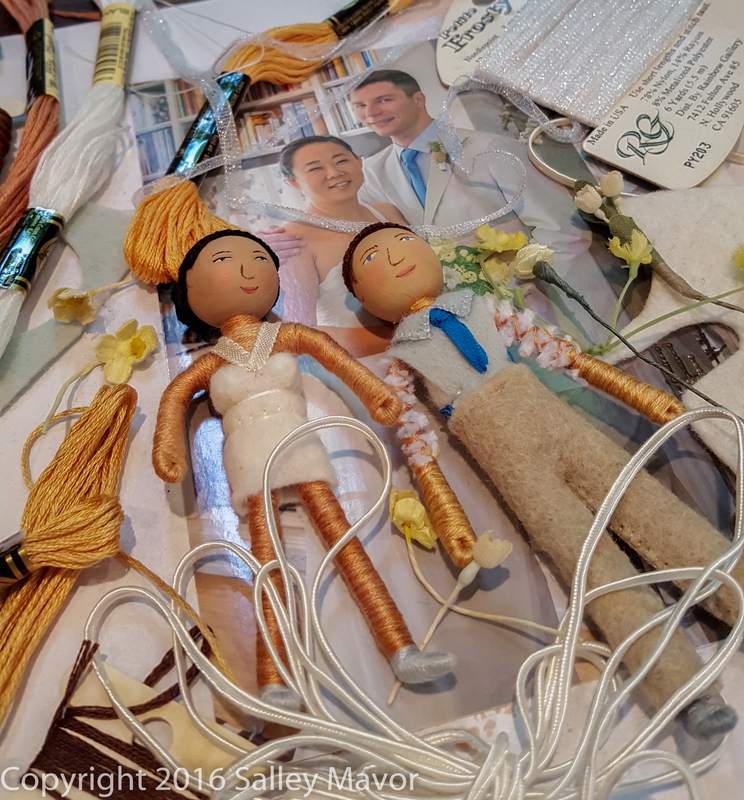 Ryan and Lael will be getting married next month in Woods Hole, so I made them a pair of dolls as a wedding present. They met here as children, when they were Woods Hole summer kids. And this wedding will join two families that have been coming every summer for generations. I’ve always been a bit jealous of the summer people, who seem to appreciate their time in Woods Hole more than we year-rounders. For them, it’s special and magical, like summer camp, where you play and socialize, without the regular responsibilities associated with your “winter” home. It was clear that a conventional white gown and tuxedo would not represent this couple’s theatrical leanings and spirit of adventure. Since the bride and groom have more than a passing interest in medieval history, I dressed them in period attire. Their costumes were so much fun to research and figure out how to make. 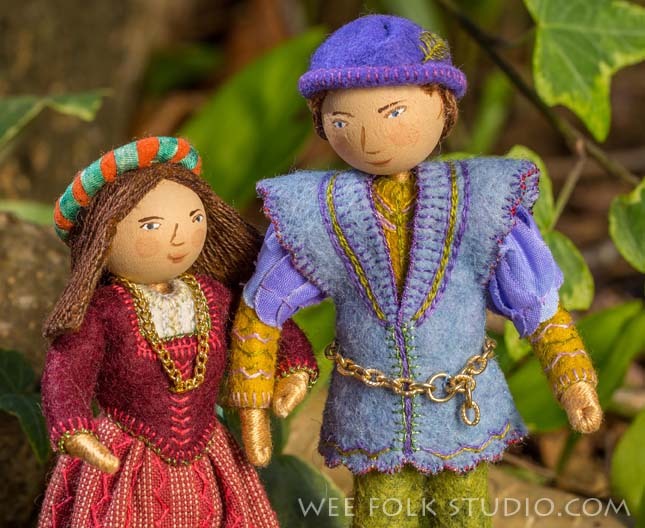 As with the Glen and Susan dolls, these figures use some techniques, such as wig-making, that will be included in the new edition of Felt Wee Folk. 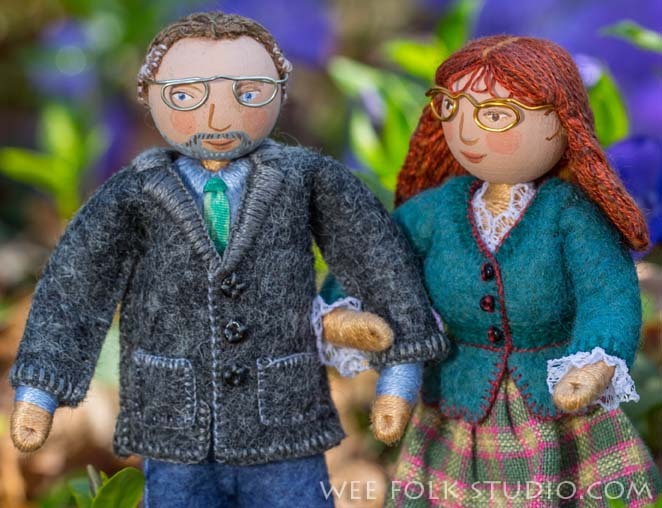 Felt Wee Folk: New Adventures will be coming out in the spring of 2015. Glen and Susan surprised everyone when they got married in a small private ceremony last December. They are a special couple, who are happy to have found each other at this stage in their lives. Now, they are planning to celebrate their union with their friends and family at their home in June. 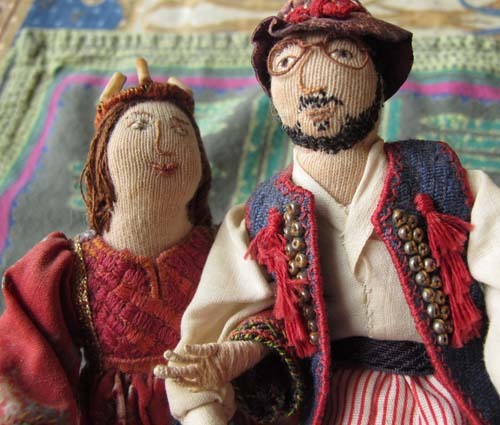 I thought that they could use a pair of portrait dolls for the occasion, perhaps as cake toppers. I delivered the dolls a few days ago and you should have seen the look on their faces! How do you like their eye glasses? It’s the first time I’ve tried making them and now I want to experiment with more ways of bending wire. And how about this photograph? I am so lucky to have my husband Rob document my work at a moment’s notice. We set them up outside in the periwinkle patch and took their photograph at different times of day, with natural lighting. I really like the way this one came out–it shows the dolls in a scene, but you can see the details, too. 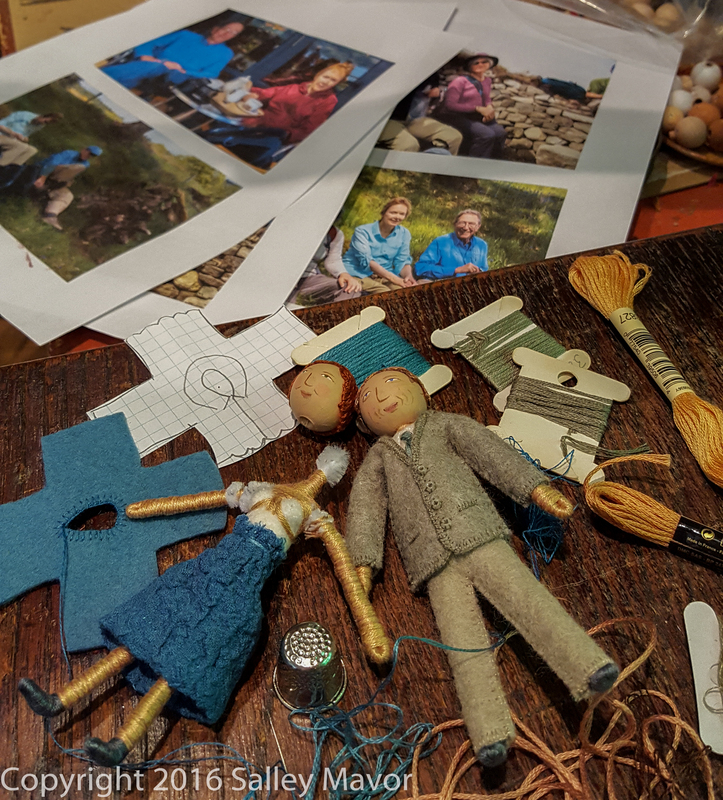 These dolls use some new techniques, like wig making (not the eyeglasses-they were made after the manuscript was handed in) and clothing, which will be included in my new book, Felt Wee Folk: New Adventures (Spring 2015). 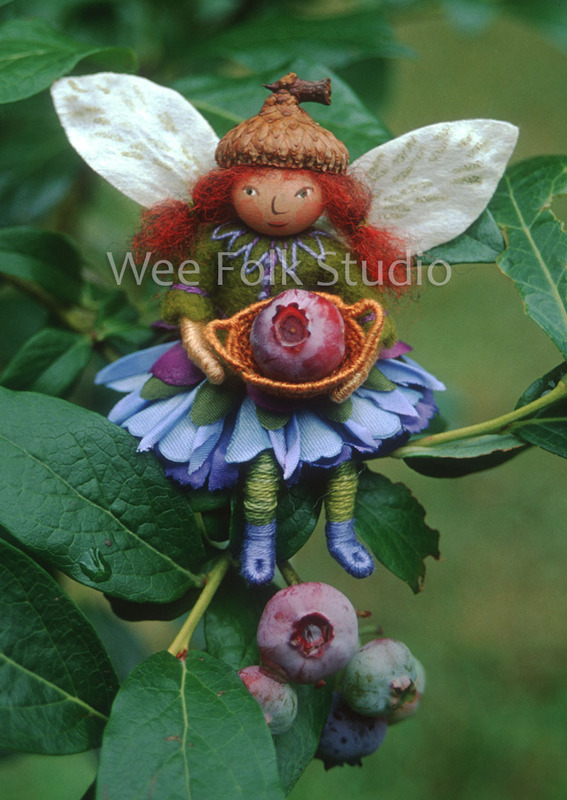 Until then, the original edition, Felt Wee Folk: Enchanting Projects is still available from my Etsy Shop here. 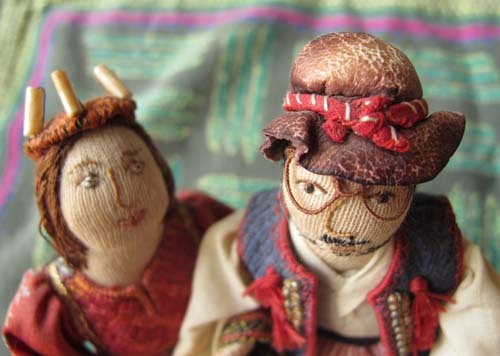 On my recent trip to visit my sister and her husband in Oregon, I took pictures of their wedding dolls. I made them for Anne and Dennis when they married in July, 1988. 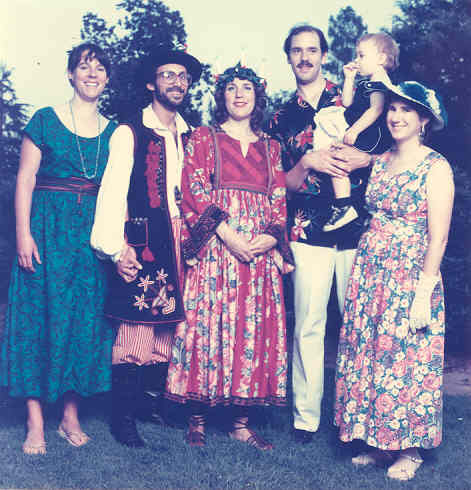 In typical Mavor fashion, the wedding was an eclectic blend of cultures and styles. It would be out of character if any of us had a conventional wedding! Anne wore a dress from Afghanistan, with a Swedish crown of candles. (She spent a college year in Sweden.) Dennis wore a Polish outfit in a nod to his family heritage. The dolls are about 6 inches tall and I think they were displayed on top of the wedding cake. 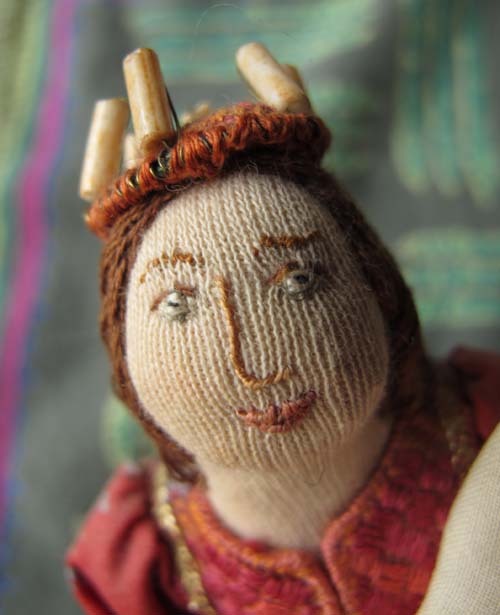 The candles on her head-dress are tube beads. The hat, shoes and boots were made of real leather. I remember enjoying adding the decorations to their clothing. It was fun to revisit the dolls after 24 years! 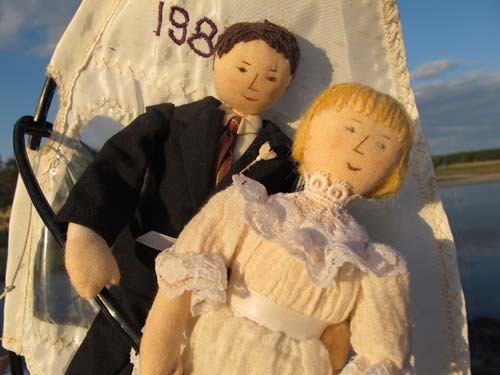 Back in the 80’s, when my friends were getting married, I made portrait bride and groom dolls for their cakes. One memorable pair was Ben and Julie, riding side by side on a toy windsurfer. Julie showed me what her dress would look like ahead of time, so that I could match it. I don’t think Julie actually wore red pumps at the wedding, but these Tammy shoes were the right size. Ben wore Ken’s leather slip ons. The shoes are stuck onto the board with double sided tape. 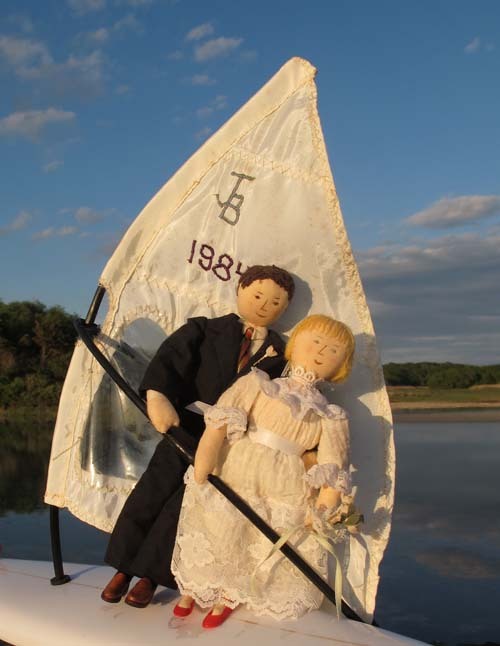 Over the years, the dolls had started to fall off the boat, so I reattached their hands to the boom. Now they can go back home to Ben and Julie’s. We went down to Woodneck beach in early evening, just before sunset, to take photos in the low sunlight. See other posts about more recent wedding figures here and here. Shona and Amy’s wedding was as wonderfully unique, warm and loving as they are. 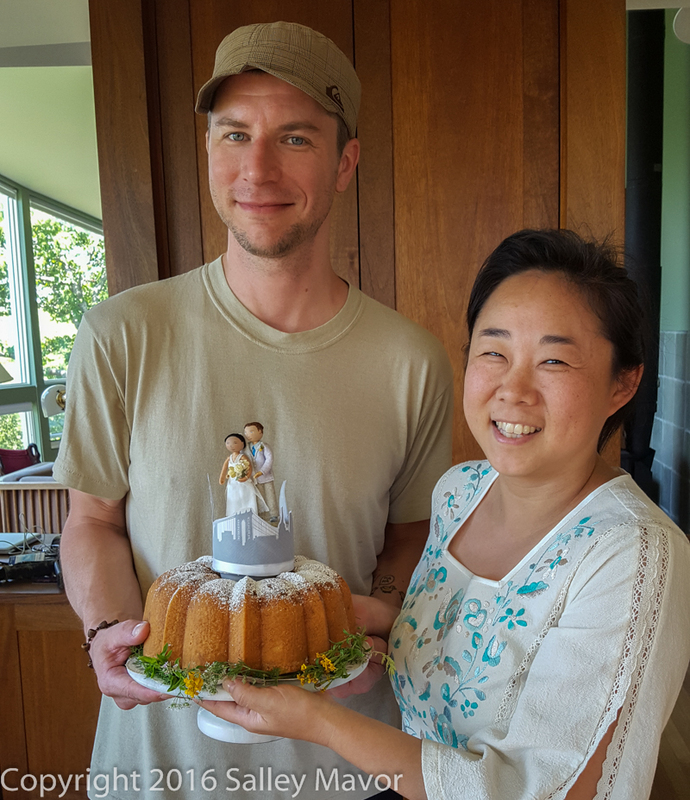 My friend Terry and I made their cake as a gift and they graciously left the details to us. We have worked together on many projects, including the Woods Hole Village Quilt. 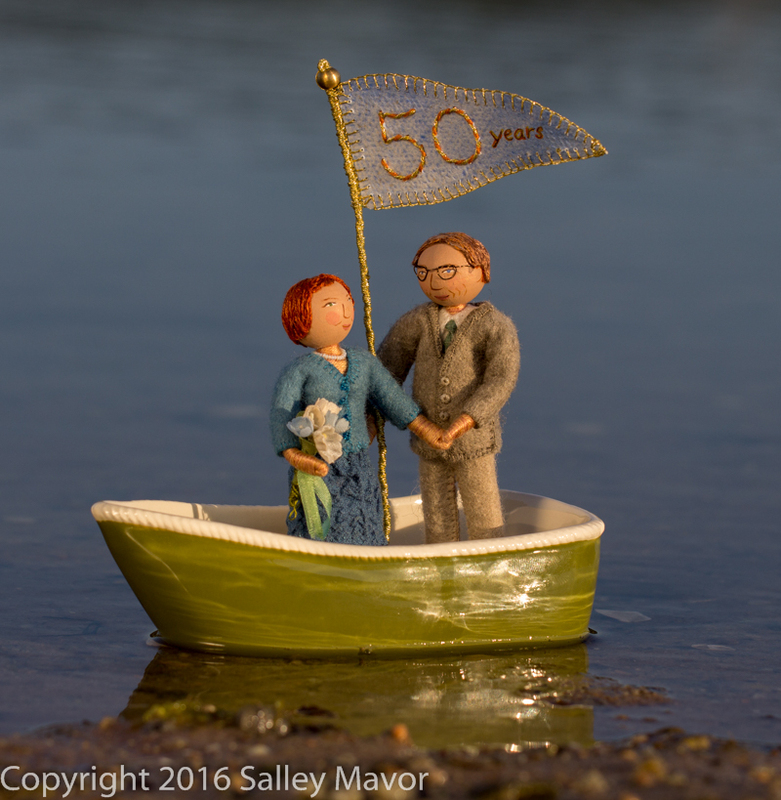 For the cake, we were free to create our own vision of our friends and decided to feature our local corner of southern Cape Cod. On Friday, Terry and I got together at her house to work on the decorations. The cake was going to have a raspberry filling, so Terry needed to cut the large cake sheets in half. Using a setup her husband Keith devised for the purpose, she sliced the cake with a saw rigged with a banjo wire. I busied myself cutting parts out of fondant, while Terry spread the filling and spread the frosting. I combed a wavy texture with a pointy toothed triangular tool. Then, I sprinkled blue shimmer dust on the waves through a fine strainer. Woods Hole and the Elizabeth Islands were made of fondant and covered with green shimmer dust. I spelled out Buzzard’s Bay and Vineyard Sound, using cute little cookie cutters. I also made the wedding couple’s house out of marzipan. Terry piped the cake edges with frosting and we started to add decorations. I had made a fondant banner with the wedding date 2 days ahead and it had dried enough to crack in places, so we had to do some patching. Terry had found these worm shaped candies, which we used to make a wavy border pattern on the lower tier. Terry fixed the banner, while I added candy fish, lobsters and octopi. This project was becoming more fun by the minute! We made a candy stone wall along the base of the cake. And added some walnut-shell sailing dinghies and another candy wall. Beeswax holds the masts on place. Here’s the sea gull’s view. And yesterday, Shona and Amy saw their cake for the first time. What a special day!